Danielle Leigh has more on the pipe bomb suspect Cesar Sayoc. PLANTATION, Fla. -- Cesar Sayoc has been taken into custody in connection with the mail bomb scare that has widened to include more than a dozen suspicious packages intercepted in states around the country over the past several days. Sayoc was arrested around 10:30 a.m. local time Friday at an auto parts store in the nearby city of Plantation after an interagency investigation. The Justice Department said investigators found Sayoc's fingerprint on the envelope of a package that had been mailed to U.S. Rep. Maxine Waters, and additional DNA was located on one of the devices. Investigators then tracked Sayoc through his cellphone. The department said a total of 13 suspicious devices had been linked to Sayoc, though there could still be more that have not yet been discovered. The devices, made of PVC pipe, a small clock, a battery, wiring, and energetic material, were "not hoax devices," FBI Director Christopher Wray said. Investigators are still trying to determine why the devices did not detonate. Attorney General Jeff Sessions announced that Sayoc faced up to 48 years in prison for five counts including interstate transportation of an explosive, illegal mailing of an explosive, threatening a former president, threatening interstate communication and assaulting federal officers. Thomas Fiori witnessed Sayoc's arrest. He told the AP that Sayoc didn't resist when armed police officers swarmed and arrested him. Fiori said he heard a small explosion -- probably a device police use to distract people -- before 50 officers swarmed the suspect's van with their firearms drawn. Fiori says the arrested man did not resist and "had that look of, 'I'm done, I surrender.'" Court records show 56-year-old Sayoc has a history of arrests. He has been convicted of theft, stolen property and traffic charges and in 2002 on a threat to "throw, place, project or discharge any destructive device." According to the arrest record dated Aug. 20, 2002, Sayoc called Florida Power & Light and "threatened to blow up FPL and that 'it would be worse than September 11th.'" Ronald Lowy, an attorney representing the Florida Power & Light employee, told The Associated Press that Sayoc "made a verbal threat when he was frustrated at a lack of service." Dade County court records showed Sayoc served a year's probation after a judge signed a discharge certificate in November 2002. Lowy said Sayoc showed no ability at the time to back up his threat with bomb-making expertise. 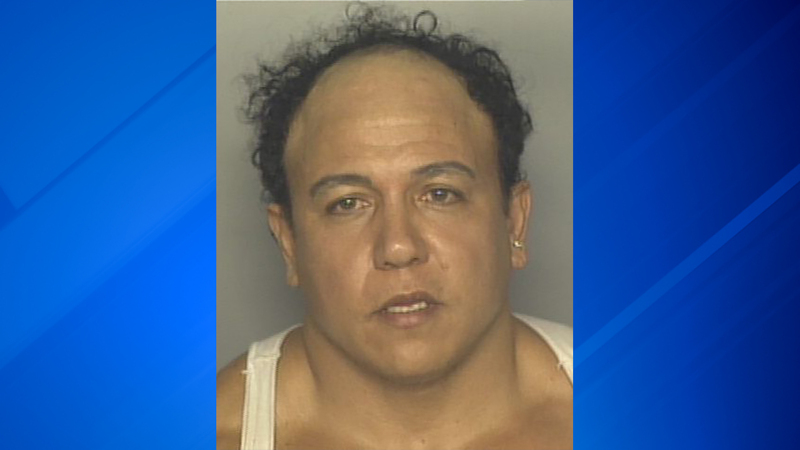 A 2002 mugshot showing Cesar Alteri Sayoc. In a 2012 bankruptcy case, Sayoc filed a petition stating he lived with his mother and had no furniture. In 2014, worked as a "road manager for a variety of traveling male revue shows," according to court documents. Sayoc sold merchandise, coordinated bookings and supervised general operations. A Twitter account that appears to belong to Sayoc includes repeated attacks on billionaire George Soros and praise for President Donald Trump and other Republicans, the Associated Press reported. The tweets accuse Soros of paying off a victim from the Parkland mass shooting and accusing Florida gubernatorial candidate Andrew Gillum, a Democrat, of being a Soros puppet. The account also praises Trump and other Republicans and includes anti-Gillum memes, with one including the caption "$500,000 SOROS PUPPET." The account includes messages tagging the figures who were sent suspicious packages, including Eric Holder and Maxine Waters, writing a version of "See you soon." Twitter on Friday had no comment about the account appearing to belong to Sayoc, though the account was suspended on Friday afternoon. Facebook and Instagram accounts appearing to belong to Sayoc were also suspended. Ronald Lowy, a Miami attorney who has represented Sayoc in the past, told ABC News that Sayoc wasn't violent but did suffer from mental illness. He confirmed that Sayoc had been living out of the van seized by investigators on Friday. Attorney Daniel Lurvey, who has also represented Sayoc in the past, told ABC News Sayoc "is a gentleman and we get along fine and there was no political agenda." "There is nothing that would be any indication of what is going on now. If he did do it, I am as shocked as anyone, and I don't say that about all my clients," Lurvey added. Records show Sayoc was born in New York and according to an online resume he attended college in North Carolina. The case against Sayoc will be handled by federal prosecutors in the Southern District of New York. Sayoc is required to appear first in the jurisdiction in which he was arrested, the Southern District of Florida. The development came amid a coast-to-coast manhunt for the person responsible for a series of explosive devices addressed to CNN and prominent Democrats including former President Barack Obama, former Vice President Joe Biden and Hillary Clinton. Law enforcement officials said they had intercepted more than a dozen packages in states across the country. None had exploded, and it wasn't immediately clear if they were intended to cause physical harm or simply provoke fear and anxiety.